Bruce Fisher's work has renewed the lives of hundreds of thousands of divorced men and women around the world. Now the author of Rebuilding has created a powerful, personal, practical, and provocative guide to building new and lasting loving relationships. 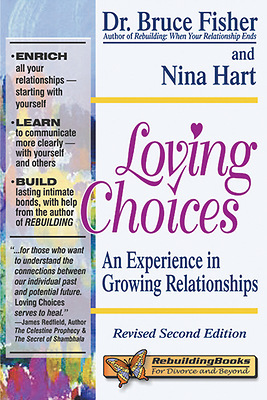 Loving Choices is packed with insights, exercises, and examples to help you get to know and develop a better relationship with yourself, discover how relationships can be your most valuable teachers, and learn how to turn life's challenges into loving choices. Offers improved self-understanding, communication skills, and intimacy. Useful for those who've been through painful relationships and divorce. Loving Choices helps individuals and couples build and create more healing and healthy relationships with themselves and others. Now in a completely revised and updated 2nd edition, this book is especially useful for those who have been through the painful transformation of a past relationship accompanied by a divorce. Dr. Fisher and Nina Hart emphasize good communication and view the relationship as a laboratory for growth.